The islands of Hawaii are in real danger as Hurricane Lane, a massive category 3 storm, churns closer and the effects are now felt as far away as Las Vegas. Las Vegas goes by many names including the ninth island of Hawaii. Las Vegas hosts many Hawaiian visitors and boasts a large Hawaiian population. 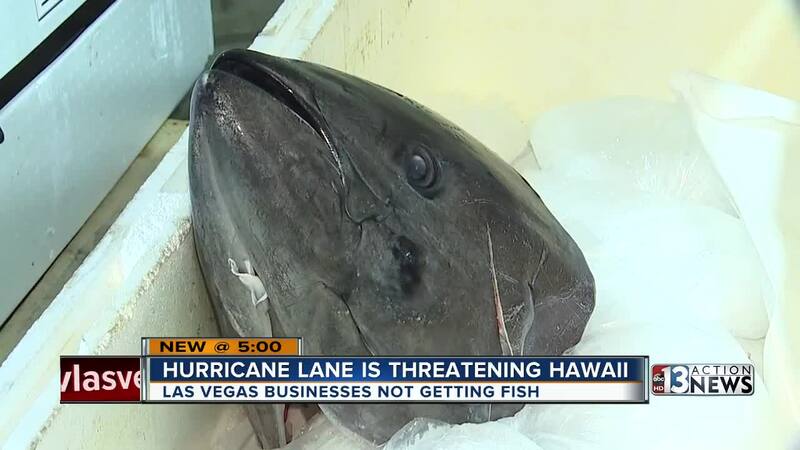 The influx of Hawaiian and Pacific Rim influence means seafood delicacies such as Hawaiian Big Eye tuna are staples in many Las Vegas restaurants. Ocean Providence distributors located near Russell Road and Interstate 15 says they are experiencing shipping disruptions that have never been seen before. "That is our little representative of tuna right now, just this little pallet," said Steve Pierce, an Import Manager, while pointing at some boxes inside a walk-in freezer. "That's it. Usually we have 4 or 5 pallets," said Pierce. Inside their enormous freezer, kept at 35 degrees, Pierce says it would normally fly in fresh Hawaiian Big Eye. The Hawaiian tuna is sought after for it is delicious taste and vibrant red color, according to Pierce. Shippers and distributors have been forced to stop operations while the dangerous storm whips up huge waves and dangerous winds. Contact 13 obtained an internal memo from Commodity Forwarders Inc, a leader in perishable product distribution, which shows the company has "embargoed cargo to their Lihue station on the island of Kauai." The notice adds CFI plans to resume operations as soon as possible after the storm leaves the area and any possible damage is assessed. As of 5 p.m. Thursday, the storm was packing winds around 125 mph. "It has a big effect," said Pierce. "There is no [fish] auction in Hawaii, there's no shipping going on," explained Pierce. "It's a category 4 hurricane, so this is actually something we've never experienced before," said Pierce before the hurricane was downgraded to a category 3. Ocean Providence is making alternative plans based on the tuna fish market disruption. "We have to know what to do," said Pierce. It is not known when shipments will resume.